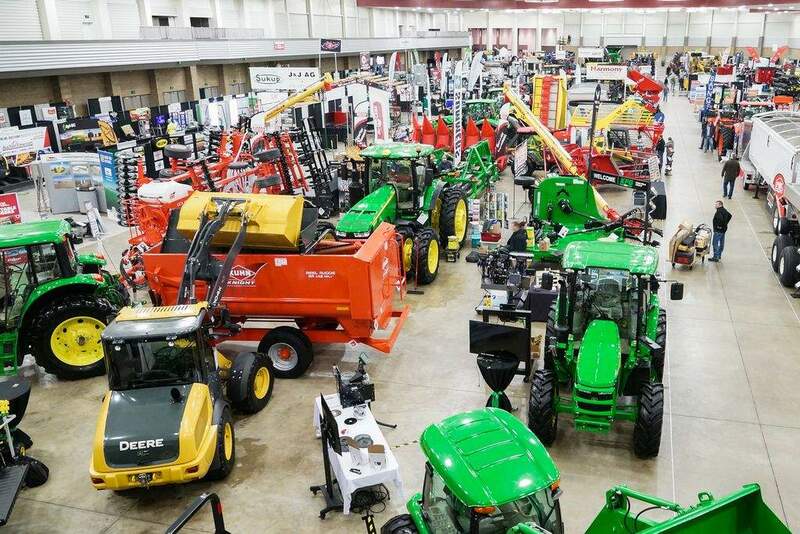 FILE: A look at the showroom floor at the Fort Wayne Farm Show last January at Memorial Coliseum. 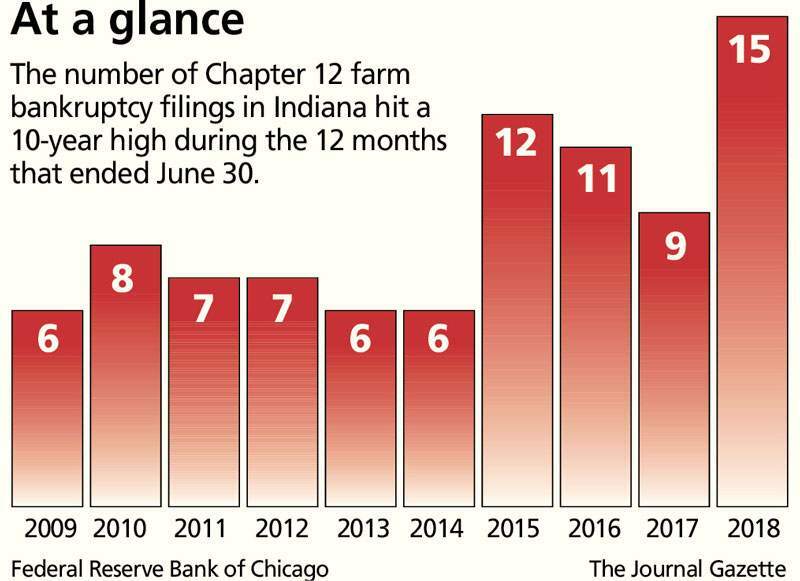 Farming bankruptcies have climbed to a 10-year high in Indiana, reaching levels not seen since 2000. During the 12-month period that ended June 30, 15 Hoosier farming operations officially called it quits, according to data from the Federal Reserve Bank of Chicago. Roger Hadley, Allen County president of the Indiana Farm Bureau, said the struggle is real. His own operation doesn't generate enough money to support his family, so he supplements it as a Beck's Hybrids seed dealer. His wife, Vickie, also works full time as Purdue Extension's Allen County director to help make ends meet. David Oppedahl, an economic researcher for the Chicago Fed, painted a sobering picture in his November AgLetter. A survey of agricultural bankers found that 43 reported higher rates of loan renewals and extensions in the third quarter for non-real estate farm loans. Those include money for new equipment, constructing grain bins, buying livestock and general operating expenses, among other needs. Only 1 percent of those surveyed bankers saw rates of loan renewals and extensions decline during the three months ending Sept. 30. The availability of funds for those banks to lend was lower than the prior year for the fifth straight year. Among the factors contributing to that reduction is a decline in the amount of money farmers have on deposit, Oppedahl said during a phone interview. In his report, Oppedaho said the last time the availability of funds to lend was this low was in the third quarter of 2000. More than half of the surveyed bankers – 57 percent – expect lower farm loan repayment rates over the next three to six months. Even more survey participants – 61 percent – expect an increase in forced sales of farm assets over the same period. 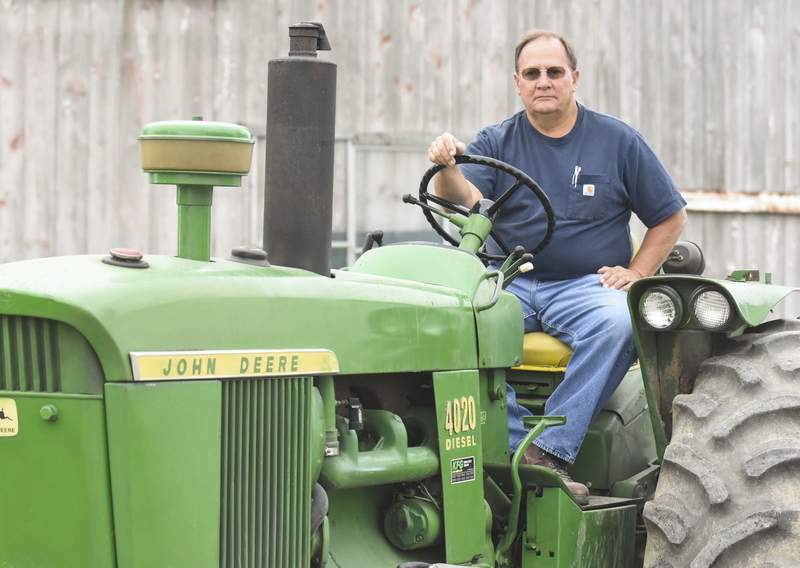 Hadley, who farms about 700 acres in Allen, DeKalb and Wabash counties, said some area farmers have had to dip into savings to keep from falling deeper into debt. “It's basically robbing Peter to pay Paul,” he said. Hadley estimated that over the past 10 years, two have been profitable for most farmers, two have been break even, and the remaining six have been losses. Farming economics can be tricky. When a farm experiences a bumper crop, that's good. It means the farmer has more bushels to sell. But when crops are abundant, the price paid per bushel falls. That's bad. “You root for high yield locally but low yields for everybody else,” said Marc Edwards, an ag loan specialist with Old National Bank. He's based in Randolph County, about 70 miles south of Allen County. 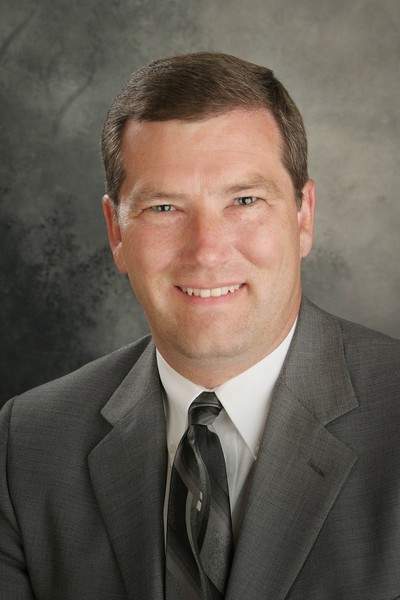 Darin Hadley, Roger's son, has been an ag lender 15 years, having worked previously for Wells Fargo and PNC banks. He now works for Rabo AgriFinance, a Netherlends-based company that bills itself as the world's largest ag lender. Those include deciding when to lock in a sale price for crops, leading one wagon load of soybeans to fetch $8 a bushel or less while the next load might bring in $10 a bushel, Hadley said. “That might be the difference between making money, staying even or losing money” for the year, he said. The increase in Chapter 12 filings over the past year reflects low prices for corn, soybeans, milk and even beef. The situation for most farmers has worsened since June under retaliatory tariffs that have closed the Chinese market for soybeans and damaged exports of milk and pork. Farmers use Chapter 12 bankruptcy because it combines the simplicity of Chapter 13 bankruptcy – usually used by individuals – and the higher debt levels allowed with Chapter 11 bankruptcy – usually used by corporations. The Chapter 12 process typically allows for repayment of debt over three years. Of course, farmers have another option: Getting out of the business altogether. Roger Hadley estimated he's received 10 flyers advertising farming operations for sale this fall. He believes some of the sales were prompted by farmers retiring before their retirement savings are whittled away even more by another unprofitable year. The Star Tribune of Minneapolis contributed to this story.